SÜDQUAI patente.unikate. in collaboration with ZMIK have refurbished a hair salon in Basel, wallpapering the entrance with photocopies from Vogue magazine. 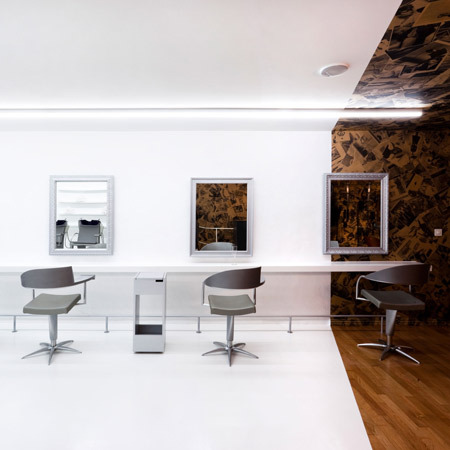 Called Nafi, the salon is divided into two distinct areas by the change in wall and floor coverings, from vintage prints and timber flooring in the reception area to the minimal white salon. The hairdresser Hairstyling Nafi in Basel’s historic city centre is undergoing reconstruction. The space is now subdivided into two zones, which are being separated by a sharp border. The two areas strongly contrast in their function as well as in their spatial atmosphere. The ceiling and the walls of the entry zone are seamlessly covered with photocopies on packaging paper made from Vogue magazines from the 1920ies until today. Opulently furnished and bathed in warm light, the entry is an invitation for a rest, for purchasing products and for discussing the newest styling – trends. In the white working area nothing distracts the work of the hair stylist. The ideal light for working, the bright and glossy surfaces and the reduced furnishing put the newly cut hairstyles into the centre of attention. The customer – literally being framed by the mirror – brings the room alive with the reflection of his face. Up for a new hair-do?